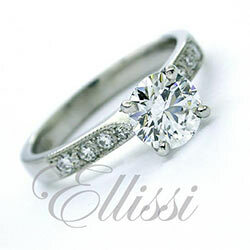 Home / Engagement rings: Custom Design / Princess Cut / “Transcend” Princess cut with double claw setting. “Transcend” Princess cut with double claw setting. 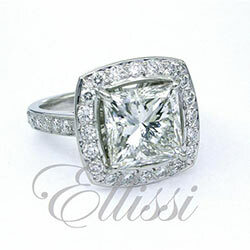 A double claw setting holding a 1.15 ct princess cut diamond of E/VS1 grade. This ring is made in 18 ct white gold and set with additional diamond content to the half way point around the band.